The village of Waterford grew steadily, if slowly by present standards. Development of the village followed as paths, then roads were established leading east and south from the first mill. What began with subsistence farming by a few closely related families grew to a diversified farming of wheat, corn, and livestock. By 1820 the village had already assumed the shape it still retains, although many of the lots platted in the "New Addition" (Second and High Streets) remained undeveloped until this century. The first mill was established near the present location of the four-story brick mill around the middle of the 1700's. At that time Amos Janney owned most of the land that now comprises the village of Waterford. His neighbors were few, situated on parcels of hundreds of acres. A road was established along the terrace above the flood plain of the Catoctin to provide access to and from Janney's Mill. When ten acres of land were sold in 1755 for the construction of the Quaker Meeting House about one half mile east, the pathway was extended and the two poles of Waterford were established. Joseph Janney's subdivision in 1792 succeeded in establishing a village center to support the surrounding farmland. In the early 19th century Asa Moore and Thomas Phillips, Sr. bought up many smaller parcels along the creek northwest of town, perhaps speculating on the expansion of the village in that direction. However, when further subdivisions were made by Thomas Janney, David Janney, and Amos Gibson in the first decades of the 19th century, these extended the town to the east up the big hill toward the already established Quaker Meeting House and to the south along Second Street. The Union of Churches Cemetery was created along Fairfax Street adjacent to newly created lots on High Street not far from the Meeting House shared by other denominations. The growth of the village cannot be separated from that of the surrounding agriculture. John Jay Janney often uses the term "neighborhood" to describe the interrelationship between town and farm. Many of the farmers on surrounding land also invested in town lots and houses which are mentioned in wills. Some farmers were also merchants who maintained a base of operation in town, while running a neighborhood farm. The concentration of farm population provided a critical mass necessary for craft and service specialists. In addition to providing the goods and services vital to the agricultural economy, the tradesmen supplied a labor pool for the extra hands required at harvest time. "The rule was, to pay them the wages per day that wheat sold for per bushel" (J.J. Janney, p. 71). 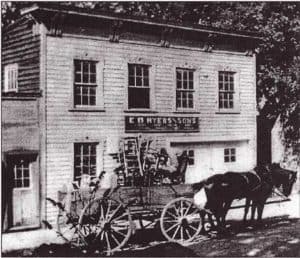 Before the Civil War, Waterford was the second largest town in Loudoun County, and as a commercial center for farms within a radius of five to eight miles, served a large portion of its northwest corner. Most of the structures now standing on Main Street, many of those on Second Street, and others that have since been destroyed were in place by 1840. Many of those were occupied by commercial establishments that provided just about everything for farm, domestic and personal upkeep. The census of 1860 lists seven merchants plus blacksmiths, tailors, shoemakers, cabinet makers, saddlers, hotel and tavern keepers, a confectioner, a tinner, and an ambrotypist among others in Waterford. The Loudoun County Land Book of 1860 lists "Amasa Hough Inn" under taxable personal property listing assets of two cows, value $40. The villagers were neither entirely Union nor Confederate in their sympathies and there must have certainly been tension in the village or even within families. The restrictions on trade and travel would have presented some difficulties in distributing produce and obtaining supplies, but day-to-day life on the farms and in the village was relatively undisturbed. Several skirmishes within the Waterford neighborhood brought the war all too close to home, and some townsmen reacted aggressively to the violations of the town by forces from both sides. The Loudoun Rangers, two Companies of Volunteers from Virginia which fought for the Union, were commanded by Samuel C. Means who before the war had been the miller and a Quaker. The Rangers were the target of several raids within the boundaries of the Waterford National Historic Landmark. An engagement in and around the Baptist Church severely damaged the structure in August of 1863. When General Phillip Sheridan raided Loudoun Co. in November, 1864, his 5,000 men took horses, livestock, burned crops in the fields, and destroyed 230 barns, 8 mills, and one still (Goodhart, p.168). Although family stories abound of burned barns in the Waterford area, there is virtually no documentation that would indicate the extent of the destruction. The physical evidence suggests that as many barns in the vicinity were spared as destroyed, but barn-dating is difficult as replacements were often built on remaining foundations with salvaged materials. The aftermath of the war was serious, but several factors served to mitigate the effects in the Waterford area. Railroads had been destroyed, but the railroad hadn't yet made its way to western Loudoun. There had been nothing of strategic importance in western Loudoun other than farm animals and crops which had been stolen or destroyed by the armies of both sides. At the close of the war, those who did not take the Oath of Amnesty were again threatened with confiscation of property, this time by the Union victors. The decrease in the amount of land under cultivation following the war "...due to conditions growing out of the change in the system of labor which prevented a complete rehabilitation of agricultural industry" (Head, p. 83) was not so evident in western Loudoun. The inhabitants of Waterford and environs had never been so dependent on that "system of labor," slavery, as had the rest of the state, and that, too, cushioned the brunt of the long-term effects of the war. Far more critical than the war in arresting Waterford's continued development and political influence was the course of the railroad when it came to western Loudoun around 1870. Passing south of Waterford through the postal villages of Paeonian Springs, Hamilton, and Purcellville, the rail line redirected the trade and growth which earlier transportation routes had directed through Waterford. An examination of these "new" railroad towns shows in their collection of large Italianate and Queen Anne structures, an entire layer of building which Waterford lacks. Following the Civil War, Waterford remained a vital community continuing to provide goods and services for the surrounding farms. However, growth in western Loudoun was diverted to those communities which were linked by rail service to the larger world. By the turn of the century, the shift had begun – from Waterford as commercial center to Waterford as residential neighborhood still within the boundaries that had been established in the first quarter of the 19 th century. The village population declined as good became more readily available in the growing towns of Purcellville and Leesburg, and the services available in Waterford moved to those population centers. By the depression, the dwindling population resulted in loss of the Town Charter and the Quaker Meeting, and some of the 19th century buildings had fallen into disrepair. Mills were the chief industrial base of Loudoun County from the 1740's as wheat replaced tobacco as the staple crop. Many were in operation through 1890, and some, including Waterford's "Old Mill", through the 1930's. Not only were the mills gathering places for the exchange of news and ideas some became the focal points for the villages and surrounding agricultural land. 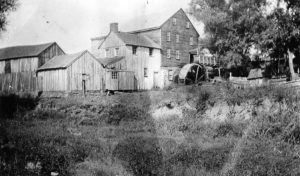 Around 1740 Amos Janney had established a mill on the banks of a fork of Catoctin Creek, which became the north end of the village of Waterford. Soon thereafter, he was joined by neighboring farmers who also relied on this mill for processing their grain. By the third quarter of the eighteenth century, mills were established at strategic locations on streams throughout the county. The historic cemetery in Waterford. Anyone desiring to build a mill was required to petition the court for a permit (Marsh, p. 2). This process ensured the water rights of adjacent landowners and protected the water supply to the mill. Next to the church, the mill was the most important building in the community, and in Waterford at least, was built before the churches. 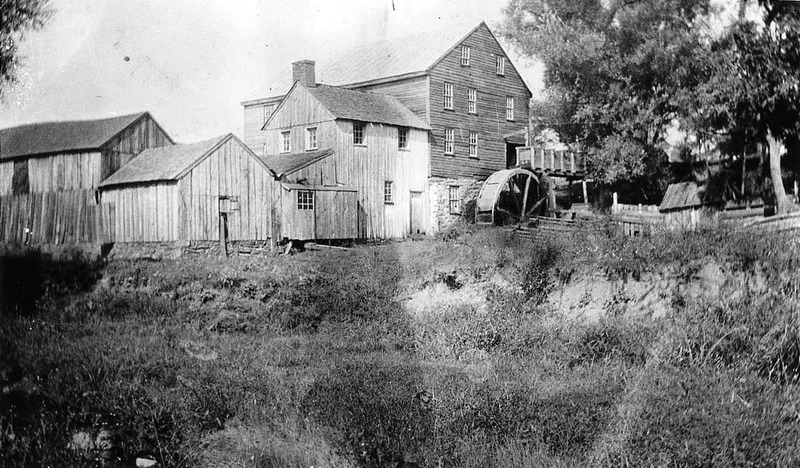 Mahlon Janney inherited the original grist mill from Amos Janney and built a second on the site. By 1825, when the property was under a deed of trust from Braden & Morgan to the Bank of Alexandria, the corporation running the operation was basically bankrupt. It is possible that the construction of a new mill building had over-taxed the finances, as the deed includes mention of a "brick water grist mill" and a "Saw Mill on the waters of Catoctin Creek in the town of Waterford" (Loudoun County Deed Book 3K, folio 164). By 1853, there were 77 mills including 6 saw mills, 9 grist mills, 21 merchant mills, 17 "grist and saw mills", 17 "merchant and saw mills", and several mills for the finishing of cloth. There were three mills within the village of Waterford and several more in the outlying neighborhood. The structure known as the "Old Mill" which still stands at the north end of Main Street ground grain; the Schooley Mill located behind the house known as "The Dormers" at the south end of Second Street was a saw mill; and a fulling mill was located near the intersection of, Factory and High Streets. The mill provided the means by which a farm fed and clothed its own inhabitants. The grist mill not only ground flour from wheat, buckwheat, rye, and corn, but ground limestone into the "land plaster" necessary for the continued productivity of the soil. With most clothing grown, spun, and made at home, the fulling mill was a necessity for cleaning and carding the homespun wool. The merchant mill served as the bank, where grain, usually wheat, was deposited at the mill and converted to flour. A farmer could then draw on the flour for his own use or to sell at market against the amount he had deposited or even pay a bill "by a draft on the miller" (J.J. Janney, p. 74). After two passes through a "wheat fan" the clean wheat was taken to the mill, "where it was passed to our credit, to be drawn out for use or for market" (J.J. Janney, p. 74). Janney goes on to say that a farmer "rarely if ever" sold the unmilled wheat. A custom mill ground grain for the use of the grower charging a fee per bushel ground. A bushel yielded 40 pounds of flour plus 15 pounds of bran (J.J. Janney, p. 74). By the middle of the nineteenth century the importance of the local mills had begun to decline. Wheat that had previously been milled locally before going to market was "taken to distant places to be ground" (Taylor, p. 27). After steam power came into use for powering mills, several were built along the Washington and Old Dominion Railroad Line (Marsh, p. 53). At Harper's Ferry, the roller process introduced in 1874 was used to produce a flour of finer texture (Marsh, p. 27). Other industries that served the agricultural community were located in, and added to the importance of Waterford as a commercial center. In addition to the area mills, Taylor's memoir of 1835 lists Waterford as having "2 cabinet makers, 1 chair maker and painter". Plows, a necessity for the agricultural community, had to be made heavy and strong enough to turn the bluegrass sod and were made in Janney's Goose Creek neighborhood by the cabinet maker (J.J. Janney, p. 83). The blacksmiths in town made and repaired hay and pitchforks, axes, screws, staples, rivets, hammers, and hatchets. "The first steel forks ever seen in the neighborhood were the load of a peddler. They were a curiosity, but were soon in use” (J.J. Janney, p. 83). There were two tiers of trade that developed in Waterford -- day-to-day commerce within the neighborhood and the trade of farm products with the primary market cities of Alexandria, Georgetown, and Baltimore. The primary trade conducted from Waterford consisted of farm produce, wheat, flour, and fattened livestock, transported to the ports of the Potomac. Neighborhood commerce provided the essentials, and later the luxuries, that could not be produced locally. Salt was absolutely essential not just for the curing of meat, but also for the animals. Traveling tinkers would not have been unknown in the community. They mended tinware and remolded pewter. But some items had to be purchased at a store. Earthenware, sugar, molasses, cotton wicking for candles, medicines which could not be grown at home such as mustard for plaster and hoarhound for coughs were usually obtained from the local merchant. "Sugar and molasses always came in hogsheads, the former of about 1200 pounds and the latter of about 120 gallons. A store keeper in the country had to have his goods brought him in the wagons of his neighbors and the only way a hogshead of sugar or molasses could be unloaded was to take off the hind wheels of the wagon and let it down on the ground." (J.J. Janney, p. 26).